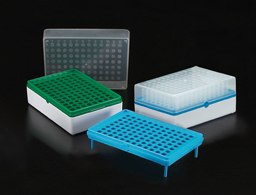 The T100 BIOTUBE rack with standard 96-well on center spacing of tubes offers a color coding system using colored interchangeable plastic grids. These are used as a support for the 1.2 ml tubes. This unique grid stands on four legs and can be removed from the base of the box and placed on a lab counter as a self-standing support. It can also be placed in a refrigerator or freezer shelf for improved air circulation around tubes, or in a water bath to allow controlled warming of the tubes and their contents. Easy to read numbers and letters used on the box cover for sample identification are also shown on the support grids. The gridded racks are available in a choice of four popular colors: blue, green, red and yellow. These racks and tubes are also ideal for storing, freezing and transporting reagents and specimens.